Network scanning for an efficient workgroup. The ADS-2800W Wired & Wireless Network Document Scanner is a professional scanner that seamlessly integrates into existing document management systems. Combining reliability and productivity to meet the needs of the most demanding workforce. The innovative and space saving design of the ADS-2800W Document Scanner coupled with top-of-the-range speed makes this the perfect work partner for your busy office environment. Fast and reliable, it lets you enjoy error-free scanning for multiple documents. Along with outstanding imaging quality and ease-of-use, it effectively delivers top-of-the-class document capture benefits to please the most demanding professional. 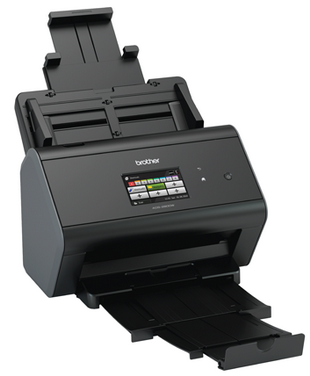 The Brother ADS-2800W desktop document scanner is simple to set up, robust for continued office use and reliable for uninterrupted professional scanning of vital documents. Offering true network capability, business critical information can be sent directly to a desired Network folder location, improving workflow efficiency and increasing productivity. The ADS-2800W also supports programmable scan destinations from the 9.3cm colour touchscreen, to instant, one touch scanning.